The Stanley Hotel in Estes Park, Colorado, dubbed the most haunted place in America, is worth a visit. The setting which inspired Stephen King to write The Shining, was haunted long before he arrived on the scene. And it appears to be a lighting rod for ghosts, scores of which haunt the four floors, lobby, music room, basement and tunnels of this historic building. The guide on The Ghost and History Tour offered at the Stanley said it’s because of the quartz that is the foundation for this building, built right into the side of the Rocky Mountains. Quartz attracts electro-magnetic fields, it draws energy to itself. This is why it’s so haunted… it’s literally like Disneyland for ghosts. When viewing the skyline of Estes Park from Route 36, there’s one building that stands out. Wedge high up on the mountain, the Stanley Hotel dominates the view. Prior to the popularity of Stephen King’s book The Shining and the movie that came out later, the Stanley Hotel was just another historic hotel in the American West. Now it’s a tourism magnet and people come from all over to visit the hotel that inspired Mr. King to write his epic horror story about a crazed hotel manager that tries to kill his family. Given my affinity for writing about ghosts and all things haunted, I had to visit and do the tour. 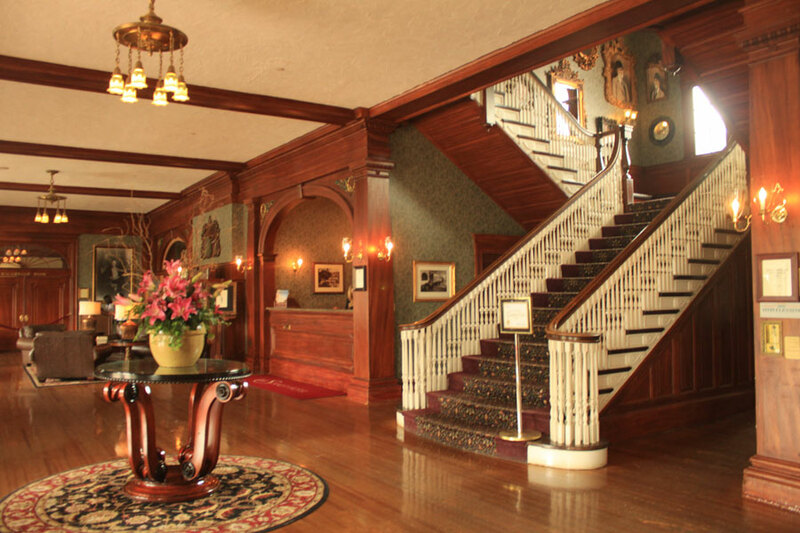 The Stanley Hotel is beautifully restored with a wide open lobby complete with winding staircase to the upper floors and old fashioned elevator. The center table had a huge flower arrangement with stargazer lilies when I visited. When the breeze blew through the open french doors leading to the porch, the smell of lilies was everywhere. This hotel has a sense of place. Those doors open onto a veranda as wide as the center wing of the house. It’s complete with tables, rocking chairs and a welcoming atmosphere inviting the visitor to come and sit … or better yet, buy your beverage at the bar and and enjoy it while you sit taking in the magnificent views of the Rocky Mountains. There is huge interest in this hotel by people interested in ghosts and hauntings. Visitors would lurk about the hotel with their cameras and ghost equipment in such high numbers that the staff couldn’t keep control. Additionally, a huge hotel like the Stanley is very expensive to run and only achieved its first year of profit in 1996, nearly one hundred four years after F.O. Stanley built it in 1909. So to maintain the elegance of the hotel (which also serves as a conference center, destination wedding locale, meeting place) and manage the crowds, prices for rooms are $279 per night. There is a $5 charge to enter the grounds with your vehicle. I made two trips to the Stanley – one to eat in the restaurant and the other to join one of the ghost tours. Both times the man at the guard house said in an almost apologetic tone, “There’s a $5 charge for parking.” The Ghost and History Tour is $15 a person. The restaurant is pricey and not worth the cost in my opinion. I didn’t mind paying the $5 for parking and the tour was worth every bit of $15. So kudos to the Stanley for carving out options for folks that can’t afford the hotel stay, but want to experience a visit to the hotel. Just a walk around the grounds and a drink on the veranda is a worthwhile experience. My full review of both the The Stanley Hotel Ghost and History Tour and the Cascades Restaurant is on Trip Advisor – look me up. 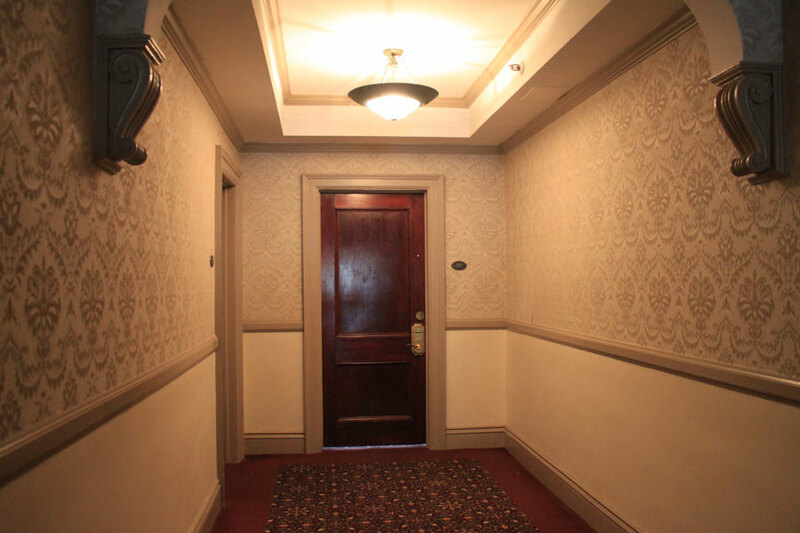 According to my tour guide on the Ghost and History Tour, when Stephen and Tabitha King stayed at the Stanley Hotel years ago, they had an unexplained experience in room 217 – the Presidential Suite. Their bags were taken to their room, but before they unpacked they went down to have dinner. When they returned, their clothing had been unpacked and put away. The hotel claimed no staff had entered their took. Stephen King also had one of the worst nightmares of his life on that trip. In it, his small son was asking for help, but he couldn’t reach him. After waking from the nightmare and not being able to sleep, he wandered around the hotel and found himself on the fourth floor (which is known to be haunted by children). He claims (according to my tour guide) to have seen the carpet on the floor come to life and move. His experiences were disturbing enough to give him the inspiration to write The Shining. Stephen King created the setting – the Overlook Hotel – based on his experience at The Stanley. 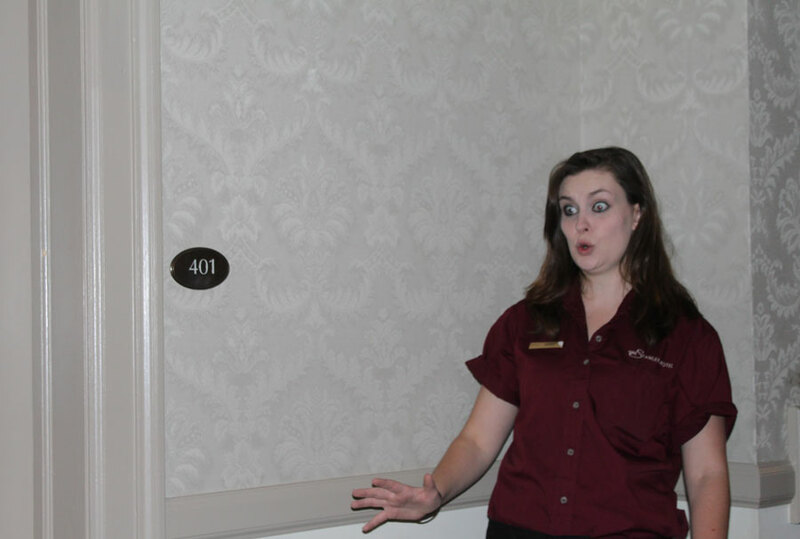 Tour Guide on Ghost and History Tour – describes room 401 – the most haunted room. According to King, Stanley Kubrick highjacked his book, and the movie wasn’t true to the story. None of the movie was filmed at The Stanley, but King later bought back the movie rights and produced a mini-series based on the book which was filmed at The Stanley. 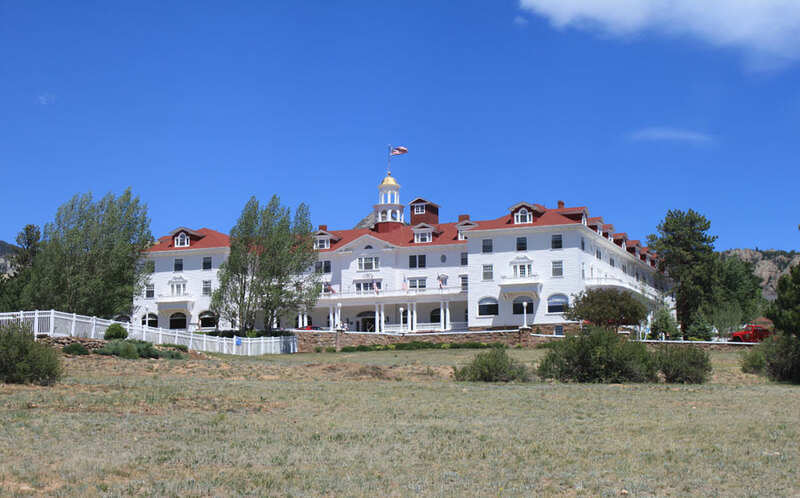 Visitors have flocked to The Stanley Hotel in droves because of the exposure given to it through the book, the film and the mini-series. And the Stanley has responded well, offering ghost and paranormal tours daily that are booked weeks in advance. Photos I took at the Stanley during the ghost tour are shown in the slideshow above or you can view the Stanley Hotel set individually at my Flickr site. Stayed there a couple of nights–not a single moan, groan, giggle, mist, orb, or any mysterious bumps in the night. Maybe the ghosts just took a few nights off during my first visit. Wonderful hotel though! I look forward to staying there again. Absolutely loved Estes Park. We just stayed at The Stanley this week for 2 nights. No guide. Interestingly enough, we stayed in Room 430 and I heard children giggling in the middle of the night! For real?!? NEVER expected that! Pretty scary!! Wow! What a story. Thanks for posting, Gina. Love to hear about those personal experiences. I loved staying at the Stanley, and I’m excited that I get a trip up there again in about a month. We didn’t experience any ghosts, but we did find a little-known highlight of the hotel: the bar has Red Rum Punch. It’s delicious, and it sneaks up on you – scary. The Stanley Hotel is not telling the truth about the Quartz (or any other minerals) under the location. We heard about this and worked with the US Government to conduct soil studies at the Stanley Hotel. We discovered that there are no such deposits under the Hotel and have informed the owners/staff about it, but they insist on spreading the stories because they are making serious money by destroying the history and reputation of a beautiful hotel. Hey Bryan. Thanks for sharing your findings. I didn’t think much of the ghost tour part of the tour as I mentioned in the post. It’s always good to get a balanced view.